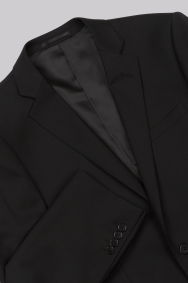 Whether at a formal dinner or a fancy bar, this tailored fit black suit from Lanificio F.lli Cerruti Dal 1881 cloth will be your perfect companion for the evening. It's made from 100% Italian super 130s wool and has a close-fitting, tapered style designed to flatter your body shape and ensure you're right on trend. 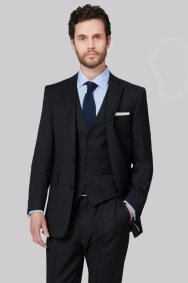 For a big occasion, choose the matching trousers and waistcoat, along with a formal shirt. Grab people's attention by opting for a bright or patterned tie. Still have not received the jacket. Very good quality cloth, great fit. 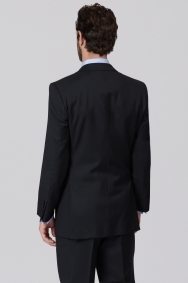 Great fitting and perfect Taylor fit suit. Perfect fit. High quality material and low price. Overall great value for money. One of the buttons popped off on the first night but quickly re-attached. Otherwise a well-fitting suit and very comfortable to wear. Good proportions and doesn't feel restricting. Good fit & finish. Quality product. 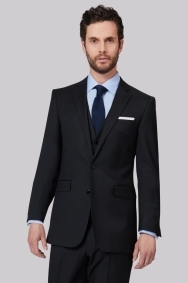 Very nice fabric and styling, fits really well for a ready-to-wear suit. Comfortable for all-day events, elegant enough for business dinners. Looks great, can't wait to show it off later. Good suit but needed alterations as wasn't available in correct size. Not the fault of the Moss team. Very useful for carrying the suit in. Top quality ... can't say more than that ... fits great and is a great cut that hangs just right. Really good to get this with the suit. Deeply disappointed at the service. Sales people more interested to talk to each other than serving customers. Hope to never return to the shop again. Disappointed! Sales person did not even say 'thank you' for the purchase. Never seen anything like this! The quality is good and it suits me. Perfect fit and fine quality jacket which looks fantastic with the matching trousers. Great material and design, stylish and elegant. Fits very well, looks sharp and seems to be of good quality. Fits my husband perfectly even though he is not an average size. Couldn't have done it without the expertise of the Bracknell staff. 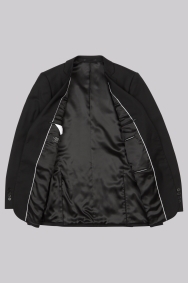 I got this in a sale and probably wouldn't have paid full price for it- the material was nice and was a good colour (black), but the jacket was too big for me and didn't seem to hang well- I'm tall and slim. Considered ordering a size down, but decided it was too much faff. I also arrived with a crease! Nice jacket, good attention to detail, and generally well finished. A frequent buyer of this product I have never been disappointed. 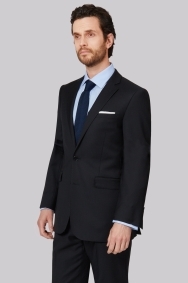 I am really please with this product and will order another suit. A very good quality suit. A classic design. I am extremely pleased with this purchase. 40L jacket had very short and wide arms. Unusual for a long & slim/tailored fit. 40L trousers maybe 3 numbers too big. Like a 40 jeans size with short legs. Very unusual. Fabric not exciting. Suit OK, but sleeves too long so will be returningit.